Broome County is an ideal place to live and work for so many reasons. Those that work here are able to have established, enjoyable careers they can be proud of, and for professionals in some industries, they are able to make incredible products every day that people, both in and outside of Broome County, can enjoy. Highlighting the products made right here--this is the purpose of Made in Broome. A new component of the Broome County...a good life initiative, this campaign will promote products that are made in Broome County, as well as the stories of the people behind them. First introduced on our social media earlier this summer, Made in Broome will feature products ranging from industry to industry, including agriculture, manufacturing, and so much more. Michelle and John Bleichert, owners of Water Street Brewing Company, and their delicious craft beers were first to be featured in this campaign. “In my opinion, there is something to be said that when you see businesses invest in our area, that confidence can be a bit contagious,” Michelle said. The products, and the stories of their creators, will be showcased on our social media, as well as the Broome County...a good life website broomeisgood.com. The site will provide people in and around Broome County a great access point on what is made here and where to get it. The ultimate goal of Made in Broome, in conjunction with the purpose of the Broome County...a good life initiative, is to promote (yet another feature of) the good life that is found right here in Broome County. We want people to see how many good products are made here and to inspire them to support our local economy, which truly does have so much to offer. 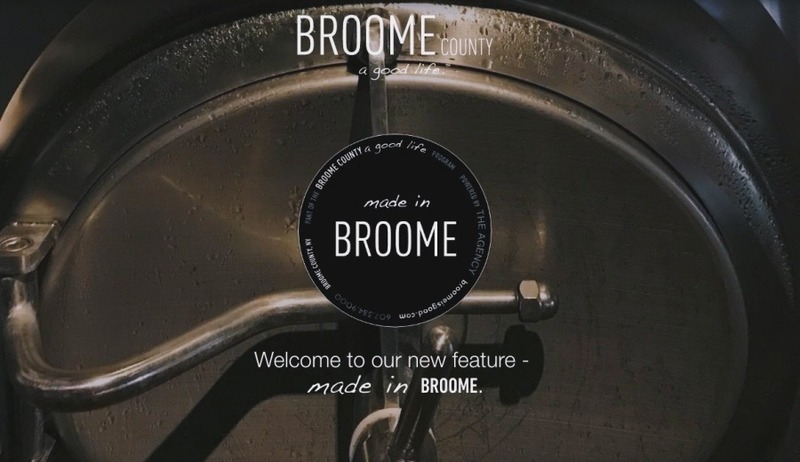 Stay tuned for more Made in Broome stories on broomeisgood.com and our social media.